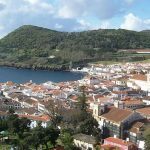 The race series started early in the year on the Azores Island of Terceira. 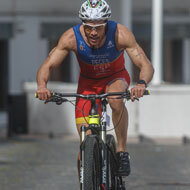 Enrique Peces (ESP) and Lisa Teichert (GER) were the winners of a tough race in a wonderful setting. 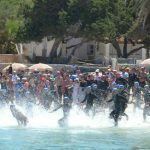 For next year the well-organised competition in the middle of the Atlantic has applied for the European Sprint Championships. 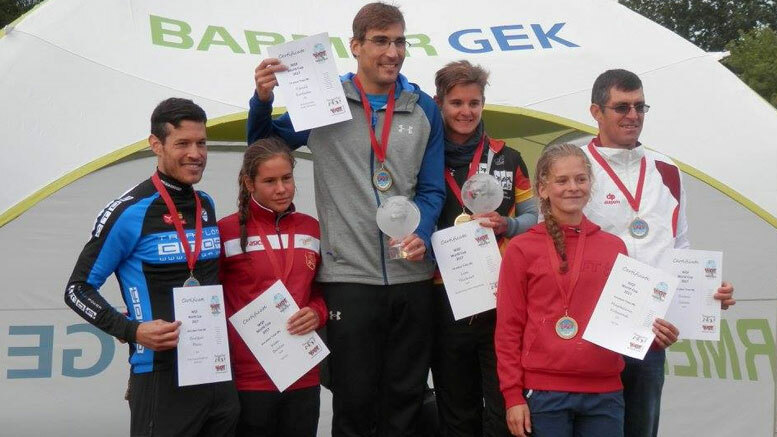 In mid-May, Orf, Hungary hosted a race again and spectators were treated to outstanding performances by the new and defending world champions over the middle distance: Gergö Badar (HUN) and Lisa Teichert. The traditional Brigg Bomber quadrathlon was won convincingly by Michal Mason and Helen Russell (both GBR) in ideal weather at the end of May. 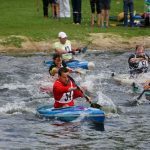 There was an emotional victory at the long-distance World Campionship in Křetinka, where the Czech, Leoš Roušavý, in his home event, pushed the defending champion Thoralf Berg into second place. Eliška Vondráčková, also from the Czech Republic took the victory in the women’s race. For next year, Křetinka is planning to run a middle distance event (possibly the European Championship). There will be another long-distance race on offer, this time again in Hannover (GER). 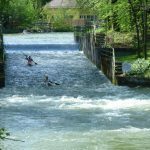 This year’s European Championships for the middle distance was held at the Koberbach-Dam near Zwickau (GER). The strong young athlete, William Peters (BEL), was the surprising winner; although he had already put in a strong performance in Orf. Lisa Teichert also won another title. Only one week later, in Týn on the Vltava River (CZE), the series continued at the end of June. This is where Tomaš Svoboda (CZE) attracted attention for the first time. Meanwhile Lisa Teichert secured her next victory. The organisers from Tyn are also planning for 2018 are there will probably be the World Championships there, but this time as a middle distance race. 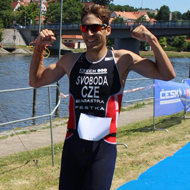 At the second World Cup in England in the Box End Park, Tomaš Svoboda once again won at the beginning of July. It was also the second victory of the season for Helen Russell. 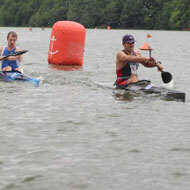 At a new venue, in Komárno, a Slovakian quadrathlon was held in the middle of August. 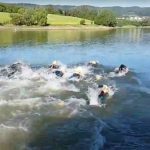 In this, the sprint world championships, Erique Peces, Tomaš Svoboda and Jonathan Monteagudo (ESP) had a very exciting competition. At the finish, Peces was ahead of the others. Lisa Teichert once again beat all the other women. At the beginning of September, the final race and the European Sprint Championships were held at the Bergsee Ratscher (GER). Here too, there was exciting racing between the two Spaniards and the strong Czechs. 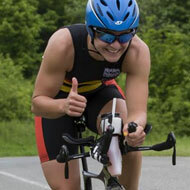 Peces, who had thrown some litter away in the wrong place, lost a lot of time and allowed Svoboda to win again, together with Lisa Teichert in the Women’s race. This race was disrupted by a thunderstorm and not everyone could complete the race. The decision amongst the women was never in doubt as Lisa Teichert was declared World Cup winner again. She has now been unbeaten for three years. Second and third places, however, were undecided until the last race where the young Hungarian, Kata Balazs was able to overtake Magalena Koberova from the Czech Republic. The men’s title was not decided until the last race. 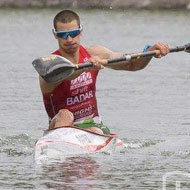 Defending champion Enrique Peces had relinquish his title to Tomaš Svoboda in the end. Third place went to the strong and, above all, very consistent Hungarian, Ferenc Csima. Even just considering the numbers, the 2017World Cup was a success: in total, there were 44 athletes who had more than 100 points at the end (vs. 31 last year), and there were clearly more athletes who had done more than four races in the World Cup (10 vs. 5 in the previous year), only the total number of participants showed a drop (218 vs. 170). Also gratifying was the fact that almost every age class had at least three athletes (for example, the Masters 60 female), and all of these athletes were still keenly striving for their age group points, even if they could not all expect to compete for the overall title. The end of one season is the prelude to the next. The WQF has been busy coordinating the dates for next year. The WQF congress is currently in progress, where amongst other things, the championships for 2018 and World Cup events will be finalised. As soon as everything is decided, Quadrathlon4YOU will report. Be the first to comment on "World Cup 2017 – Not decided until the final race"